Five bodies were spotted in an illegal goldmine that collapsed in Ghana, as the search for at least 17 miners entered its fourth day. The abandoned mine in Prestea-Nsuta, in Ghana's Western Region, caved in on Sunday afternoon when the miners were resurfacing. 17 miners are being searched for according to a government official. The abandoned mine in Prestea-Nsuta, in the country's Western Region, caved in when the miners were resurfacing and just one body has been recovered so far. Ghana's Deputy Minister of Lands and Natural Resources, Benito Owusu-Bio, visited the site of the disaster and said five bodies had been seen in the mine. 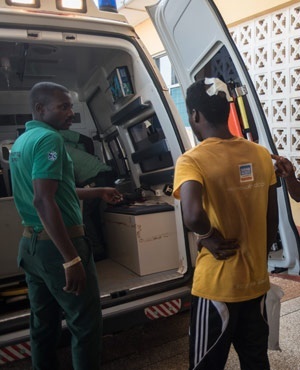 "The rescue team has informed us they have located so far a lot of bodies, they can easily make out five of them," he told local radio station Empire FM. "They can see there are others behind them, but they are involved in a lot of stone debris. They are clearing the debris then after that they will bring them out." An ambulance had been called in case any victims could be saved, Owusu-Bio added. He said the rescue operation was taking time in order to avoid further collapses. "We don't want to have on our hands any extra casualties," he said.